"If you love bread but not the carbs, these fabulous keto and gluten-free bread rolls are for you! Made with almond flour and eggs, these are the best low-carb and grain-free bread substitute." Preheat the oven to 350 degrees F (175 degrees C). Grease a baking sheet with cooking spray. Combine almond flour, psyllium husk, and salt in a bowl; mix well. Add water, egg whites, and vinegar; whisk with an electric mixer until well combined and a thick dough is formed, about 1 minute. Wet your hands and shape dough into 8 rolls. Arrange rolls on the prepared baking sheet. Sprinkle sesame seeds on top. Bake in the preheated oven until golden, about 55 minutes. 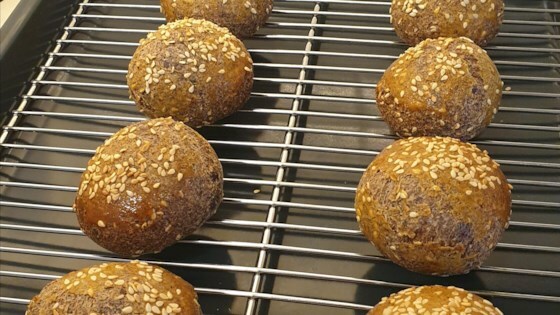 These bread rolls can be stored in the fridge or freezer. Yuck!!! It looks pretty but I could not get past the taste.